Just in time for the opening of the newly renovated Town Hall, we decided to bring out some of the Town Hall treasures in our collection. 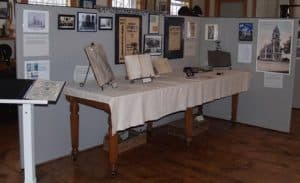 In addition to photos, the exhibit included a poster listing the prices for town hall rental in 1927, a Contagious Disease log book from the Health Deaprtment in the 1880s, an assessors book from the late 19th century, a lithograph plate of the town hall, and much more. Did you know that when then town hall was built in 1870, the most economical roof material was slate? A piece of the original was part of the display. Thanks to Ellen Harde, Mickey Crocker, John Mangiaratti, Tom Mahanna, Stacey Perron and moderator Geoff Hall for participating in our panel discussion in October. 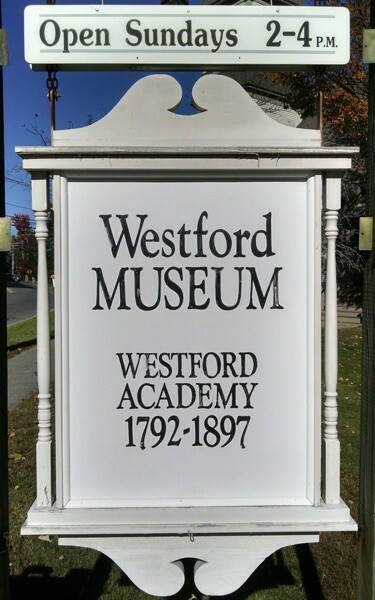 The event was filmed and will be aired on Westford CAT. The exhibit was in the museum from October 2010 through mid-January 2011.